The idea that a public and secular institution was needed to prepare citizens for higher education proliferated throughout Europe during the nineteenth century. However, because of local political, economic and social contexts the underlying model of what is now meant by secondary education has developed differently in each country. This essay provides a historical account of the development of secondary education in Portugal, in what concerns the study of nature (zoology, botany, geology and mineralogy) in liceus, during the nineteenth and early twentieth centuries. In particular, the importance given to specimens and collections will be emphasized. The emergence of laboratory-based teaching never replaced traditional approaches centred on observation of specimens. 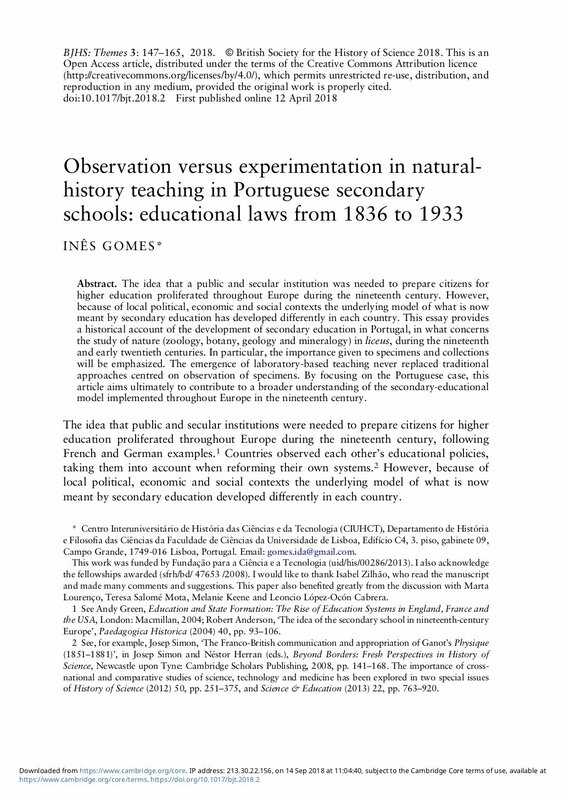 By focusing on the Portuguese case, this article aims ultimately to contribute to a broader understanding of the secondary-educational model implemented throughout Europe in the nineteenth century.